With the romance out of the way, it's time to get down to business. Weeks have passed since the two friends decided to part ways, and since Liliana began wrapping Jace around her finger. And he was securely wrapped. This is what she wanted, what she had planned. (Uh oh. Although not completely unexpected.) She hoped he was ready to handle it, and with a little bit of hesitation she sets her plan in motion. She summoned her specters and sent them flying to whisper the right messages in the right ears... however she couldn't understand why it suddenly bothered her that harm would come to Jace Beleren. The imp Ignixnax, servant of Gemreth, delightfully speeds towards the Consortium base. Most days he did what he wanted when he wanted, but the news he received was too good to let lie. He swoops down and flies past the startled guards as he makes his way to Gemreth's chamber. He tells his master that he knows where Jace Beleren is. Tag. Now it's Gemreth's turn to run and relay the message. Jace wanders the market with out much care in the world. He's happy. Too bad it won't last for long. Her servants return, and give her warning. She hadn't expected the Consortium to have reacted this fast, but that couldn't be helped now. Time to pass on new instructions. Guide Jace. And protect Jace. But only if you can remain hidden. Jace felt a chill, a hint of necromantic magic that reminded him of Liliana, but when he turned she wasn't there. There was no time to dwell on what happened though, Sevrien was there. 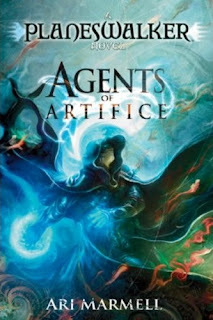 In fact everywhere Jace looked he could see Consortium soldiers trying to blend in with the crowd. Jace turns and creates all manner of illusions to aid in his escape. Kallist has established himself as the commander of the city guard of the dock?, or perhaps for a private owner. Regardless he's helping to oversee the safety of some shipment when one of his men has some disturbing news. There are all kinds of shady fellows all over the district, and they're not moving in way that indicates the interception of cargo. They're on a manhunt. Kallist knows what that must mean, and all the hurt and resentment seem silly now. There's no choice. Kallist runs off to help his friend. The elf Ireena tracked Jace with ease. A simple powder was stinging her eyes but it allowed her to see through all his illusions. Rather than keeping him hidden, they were providing a beacon to follow. When he's within arm's reach, she tosses a paralyzing powder. The powder worked instantly, but thankfully Jace's reactions were quick enough to telekinetically push some of it away. The follow up was a forceful telekinetic punch to the chest and the elf goes down in a single blow. That was easy, but he could hear the hooves of Xalmarias approaching, but the pain from the powder was getting worse and he falls to his knees. Just as Xalmarias appears, Kallist jumps on him from behind and yells for Jace to run. A few more seconds of a coughing fit and Jace gets to his feet and does. Jace expands his mind and allows it to touch all around him. Not deep enough to read all their thoughts, but enough sense the general mood of the whole area. In a sense, they would be his eyes. He feels their panic rise and those eyes move skyward, and when he looks up he spots Gemreth's demon flying above. And so his drake would have to be his reply. It's master would still have to be taken care of, and so he moves toward the wizard standing atop a cart in plain sight. Before he could reach him, the demon swoops in from behind, and so Jace's drake defends its master in the only way it knows how. Steam enveloped the demon... and all the innocents nearby. Jace is still in all of their heads and he feels each of them die.. He feels their pain, their shock, and their panicked thoughts from each and every one of them, and he collapses to the floor screaming. It wasn't hard for Kallist to find his friend. He was the screaming man curled up into a ball. He runs over but has no idea what to do. It seems that Jace does though, and he feels Jace's mind clinging to his own with desperation. Liliana appeares and together the two get Jace to his feet and to safety. They've been been found. Liliana wants to fight back (oh?) but that just seems insane. They should run. Planeswalk. Liliana tries to guilt him out of it by saying that would mean leaving Kallist, but Kallist agrees. He's not the one they're really after. They want Jace. He can stay hidden, and when the learn that Jace is gone the heat will be off him. Next was figuring out where to go. They take hours deciding on a destination, but eventually Liliana leaves to get ready. It's what Jace had been waiting for. There was another part to the plan he hadn't told either of them. Jace's powers have certainly grown. All that he had done in the marketplace was something the old Jace could never have done, and now it was time to try something else. They couldn't take his friend with them... not his body at least. But what about his mind? Tezzeret had created a device that could store memories, but what would a master telepath need with devices? He would store Kallist's mind within his own, they'd planeswalk, and then he'd insert it into a new body. That was something even Tezzeret couldn't accomplish. Without warning, Jace dives into Kallist's mind and begins the extraction. It was working... but something was wrong. It was too much, it was too hard to keep the two separate. With desperation he tried to stop the spell, but he'd already forgotten how, there was too much of Kallist's mind mixed with his own. He struggles through pure instinct despite no longer being able to tell who was who. And the struggling works. The minds were separate once again, two minds within two bodies. Both unconscious, and each in the wrong one. And here we are, with the full flashback told in twice as many chapter it took to introduce the body swap. I'm guessing we get back to the present Chapter 22. A big question that I had was answered here. Jace, the man who had a complete revulsion towards manipulating minds... how could he alter/mind swap with someone who was his best friend? I don't think I would have been satisfied if it was all done in anger, and thankfully it wasn't. It wasn't a jealous rage, and it wasn't Liliana convincing him because of blind love. It was an accident. An act meant to save his friend that simply went wrong. That feels more in character with the Jace we've seen develop before out eyes. Why is Liliana pushing so hard to attack the Consortium? Certainly should wouldn't do it for the fun of it. She has to have other motives, or perhaps... has to be working for someone who would be thrilled to see the end of the Consortium, or would be thrilled to reacquire it. That's an easy way to tie Nicol Bolas back into the picture. Liliana must be working for the dragon through some agreement, voluntarily or otherwise. Actually... what if it was Nicol Bolas and Liliana that were the two planeswalkers in the Prologue? It makes sense. One of them did arrive late, a particular characteristic that was pointed out to us in Nicol Bolas' first scene. The "Other" wanted something delivered to him, and that thing is likely the Consortium back under his control. The question now is... what is it that Nicol Bolas agreed to pay Liliana for that act?